The popular image of the Civil War nurse is that of the angel of mercy, caring for the wounded on the battlefield. Hospital Days shows a woman nurse as administrator, establishing the groundwork for a new profession. 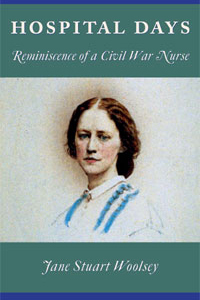 Jane Woolsey, Superintendent of Nurses at the Fairfax Seminary Hospital in Alexandria, Virginia, gives a contemporary insight into the medical practices of the period, the role of women, and the routine of a soldier's hospital recovery. Woolsey shares stories of hardship and courage based on her three years in the wards. This second edition includes a new introduction by Daniel J. Hoisington.